Out of all the hilariously true things Barney Stinson has ever said, ‘Suit up!’ was probably the most legendary — and the founders of this dapper bespoke label know exactly why. 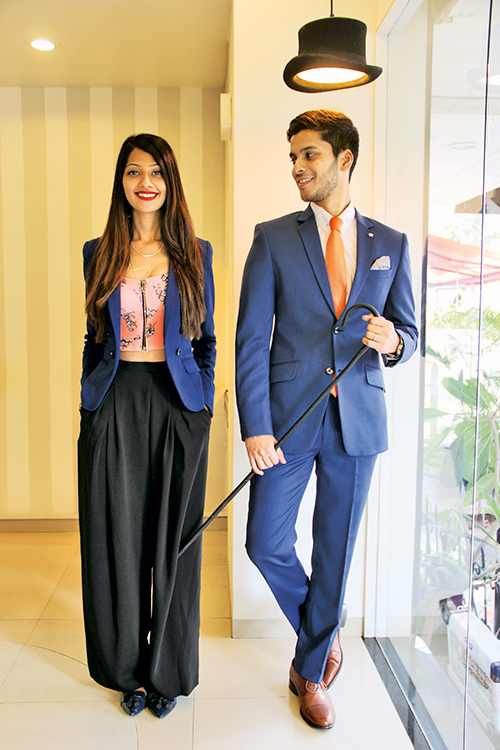 Two years ago, a mustachio-emblazoned store in Mumbai became a trail ‘blazer’ with its exclusive made-to-measure and immaculately-tailored suits, Egyptian Giza cotton shirts, bandhgala jackets and quirky accessories. When SS Homme’s Sarah Sheikh and Sandeep Gonsalves recently wed after a seven-year-long relationship, the outfits of the groom’s entourage received much more attention than the bride’s ensembles did! Undeniably, there’s nothing more appealing than a well-tailored suit. The style mavericks have dressed and impressed sharp gentlemen like Amitabh Bachchan, Ranveer Singh, Siddharth Malhotra and Arjun Kapoor, to name a few. Sandeep articulates, “Our ideas sprout from common ground; we work well as each other’s sounding board – critiquing rather than contradicting the other’s opinion,” while Sarah says, “It is also important to give your partner his individual space. There’s no place for growth if you are constantly interfering in each other’s work.” The duo hopes to launch SS Homme on a global platform soon, but, for now, they are all set to iron out the competition with their SS15 collection, Summetry, guided by structured lines and wearable art.